On Wednesday, October 10, 2018, a group of twelve graphic design students from Curry College toured Braintree Printing, Inc. in Braintree, MA, accompanied by their Design & Production instructor, Chris McCusker. The visit was the result of a long-term relationship between Jim Corliss, Owner of Braintree Printing, Inc., and a customer who became a teacher at a local college. The visiting students split into two groups and spent time in the prepress department with Prepress Manager, Stephen Rogers and Director of Technology, Kim Kreitman. They also spent time in the pressroom with Pressroom Supervisor, Scott Knowles. 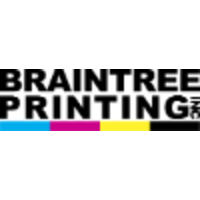 “The staff at Braintree Printing could not have been more accommodating - they were all very happy to share their knowledge and insights,” said Chris McCusker. The American Printer team salutes Jim Corliss and the Braintree printing team for investing their valuable time to expose design students to the power of print. Those design students represent the next generation of print buyers/influencers who may have never before been informed of how print can help them achieve their design objectives.